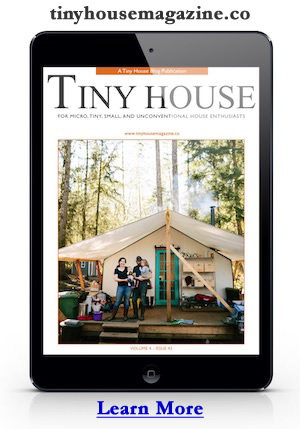 Dan, one of my readers, sent me a link to his new blog which documents the creation of an 8′ by 20′ tiny house of his own design. Drawing from his own previous experience with Google SketchUp and inspiration from websites like Tiny House Design, Dan set out to solve a housing challenge for his mom by designing and building her a tiny house. Your site has been an inspiration to me. My moms living situation is not optimal so I have decided to build her a tiny house. I just started and you can track my progress at tinyhouseproject.wordpress.com. I just wanted to tell you to keep up the great work. I had played with SketchUp some time ago but after seeing your designs done in them I was really impressed. I’ve been keeping my laptop out with me while I build so I can know the dimensions of every board I need to cut as I go along. It’s now one of my most important tools, once again, thanks to you. Thanks again for sharing your project with us Dan… and recording the design and construction progress online. I’m glad that my work here on Tiny House Design helped inspire your solution but it’s really folks like you that pick up their hammers and saws that should be admired. Below are a few more examples of what you’ll find on Dan’s blog, tinyhouseproject.wordpress.com. This entry was posted in Tiny House Projects and tagged custom design, dan, dormers, google sketchup, mom, tiny house. It is so neat to see so many people stepping up to the plate and designing and building their own homes. I think it is a sign of the times that so many do-it-yourselfers are making it happen in their lives. It really inspires me to share as many of these stories as we can to inspire others to step forward and do the same. Such a cool design Dan and I agree with you about Michael’s inspiration. I look forward to seeing each new design he comes up with. This will be a nice looking house when finished. I like the dormer windows he is building into the roof. He should be able to get the shell complete before anyone complains too much. Most tiny houses I’ve seen are built on non-custom trailers. Most designs tend to put heavier things (bath, kitchen, loft) in the back of the trailer to offset the rest of the house on the tongue. I suspect that a custom trailer and a carefully planned house would be ideal but so far I’ve not heard of any problems from the owners of tiny houses. Although they tend to be much heavier than normal travel trailers so a stout trailer and truck are best. Thank you for your reply and tip, but a commercial trailer is NOT an option for me! Been there, done that 🙁 No! I really like the idea of self made tiny houses, and are currently making my own. That’s why I’m looking into this, and I’m sorry, but most of the mobile tiny houses I’ve seen described on the web, tend to put heavier things (bath, kitchen, loft) in the front! This, together with top heavy construction and rear-displaced wheels, makes the tongue weight way ABOVE the recommended hitch weight percentages! But don’t take my word for this, it’s easily checked out with a scale! Good to know that none of the owners of tiny houses have had any problems. But it needs only one disaster to ban the self made trailers from the road! Building one myself, I’ll work hard to prevent this to happen. Towing a trailer is no small responsibility and should be undertaken with great care and an eye toward safety first. An accident with a tow vehicle and trailer can have much greater consequences than carelessness with a small car. Like an airline pilot who is responsible for expensive equipment and many lives, you should take your responsibilities as a designer and tow vehicle driver very seriously and learn all you can about doing the job safely and well. Whether you tow a light boat or camping trailer behind your car, a vacation trailer behind a motorhome or a cargo trailer to haul a race car or move personal belongings, balancing the load and preparing the trailer and tow vehicle are critical to safe handling. One of the most critical aspects of safely operating a trailer is knowing the weights involved and where they are placed. The first thing to determine is how much is being towed and confirming that it is within the capacities of the equipment being used. Determining WHERE that load is placed is critical to the way your rig will handle on the road. Leaving too much weight on the hitch can also cause a dangerous situation where the tow vehicle doesn’t have enough weight on the front wheels to control your rig. When you hit the brakes, the trailer dives lifting the front end even more, and you lose most of your braking and steering at the same time. There is much to be found on the net on this topics, and I’m only trying to help. Good thinking. Let me take a look at the info Prune provided in more detail and check with him on the idea of collaboration.